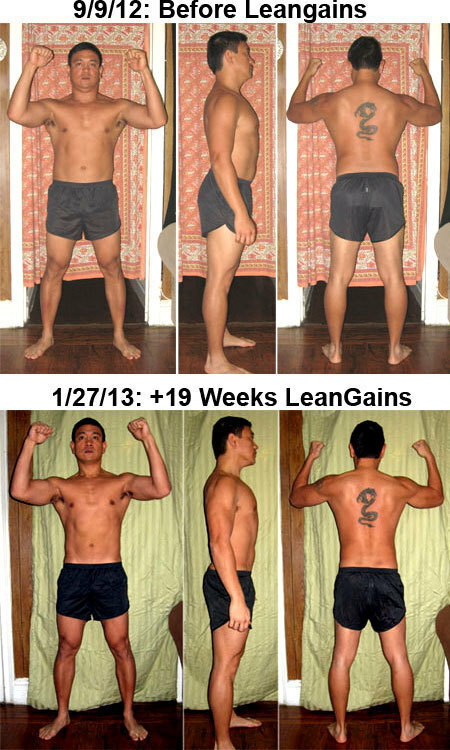 LeanGains: +19 Weeks Review – My Journey to Godliness! So I attempted a Paleo diet a while ago with good success. A week or so afterwards I started on LeanGains after coincidences kept having me stumble about it. 19 weeks later and I have made decent progress on my attempt to get leaner! My goal was to try to get as close to 10% body fat or lower. In the time that I have been doing LeanGains I managed to get closer to that goal. I think this is the leanest I have ever been in my life! There was stumbling blocks along the way but it wasn’t too bad a ride. The toughest was adjusting to the fasting regimen. This makes the first couple weeks difficult as I at times felt weaker. Not new to me considering this is something I have experienced when I attempted Paleo at first. I was very rigid at first, like when I started on Paleo, and made sure to count everything I ate and eat only during my eating window and none during my fasting window. Calorie counting stopped once I got better at guestimating my meals again. There were times when I did have some speed bumps along the way (i.e. : dirty meals, broken fasts, etc) but it didn’t ruin me. In fact, I think there were times when my body actually needed the extra nourishment that I was holding back from that I thought I ended up having an unplanned cheat meal! If I have to start all over again I probably do something like this. Make sure to eat more healthy fats! Unfortunately life is not perfect so I have to make do with what I have. I enjoyed LeanGains but I may modify it slightly due to my schedule. Still will fast but may make my eating and fasting windows different on some days but will try to keep it in a LeanGains protocol when I can. Right now I just want to get to 10% Body Fat and then do a clean bulk while maintaining as a low body fat as possible! I know that the leaner you get the more difficult it is to achieve but I will at least try! Those last few percentages will be another adventure! Amazing results. I found your blog on Zemanta after reading loads about IF, leangains, warrior diet etc. I’ve just started eat stop eat. Have you tried it, any good results?